With real large diagonals and projection films, shows or sports events are a great experience. But where to put the projector? Often, users run into difficulties as they do not want to install it on the ceiling. The Screeneo HDP 1690 TV solves this issue, because it can project large images from a very short distance. It delivers a diagonal of up to 100 inch (more than 250 cm), but only needs to be a maximum of 44 cm away from the wall; this is often already possible on a sideboard. 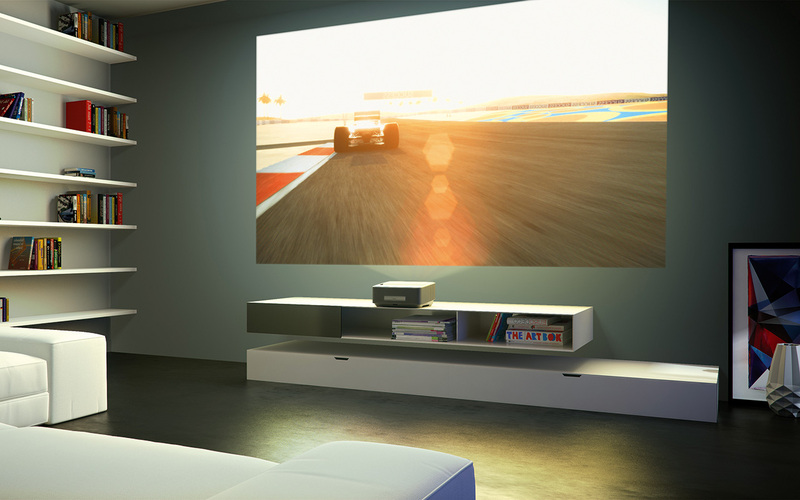 Besides three HDMI inputs the Screeneo can receive wireless signals via WLAN. Two integrated loudspeakers provide the adequate sound; if there is no hi-fi system around, the clever projector is ready to support spontaneous parties. The DLP technology with an LED light source creates a long-lasting enjoyment of up to 30,000 hours.